For those of you with dietary restrictions, desserts could be a challenge. Many cookies and cakes that you can buy tend to be dry, bland, or artificial. If you're tired of these tasteless treats, you are in luck. We've found something that's actually good. Thanks to The Piping Gourmets, you can have your cake and eat it, too. The Piping Gourmets offer a variety of innovative, healthier desserts for today’s conscious consumers. 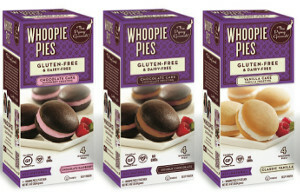 Their most popular product, the Gluten Free Whoopie Pies, are all natural and certified Kosher-Pareve, Non-GMO, and vegan. The full line includes six delicious flavors - chocolate chocolate, chocolate vanilla, chocolate mint, chocolate raspberry, vanilla lemon, and vanilla vanilla. If you don't already know this, a whoopie pie is a dessert that consists of two cake-like cookies sandwiching a creamy, frosting-like filling. The Piping Gourmets' whoopie pies have that fresh out-of-the-oven taste. They are so fluffy, decadent, and sweet. You will definitely be impressed when pull the whoopie pie from the box. It actually looks like the picture. The two cake rounds are plump and pillowy and there is a generous amount of filling in between. The chocolate cake is rich and moist - perfect for chocoholics. The vanilla cake is soft and light with a classic vanilla flavor. My favorite whoopie pie was the chocolate mint one. The dark chocolate cake paired wonderfully with the intense mint icing. I also enjoyed the vanilla lemon one. It reminded me of the ultimate tea party treat. The lemon icing was delicate and had a subtle citrus flavoring that allowed it to be comforting instead of pucker-inducing. It was refreshing and total stand-out, in my opion. I liked how the colored fillings (lemon, mint, and raspberry) looked natural, not fake. It wasn't a bright, sickly yellow or an overpowering lime green. Instead, the frostings were lightly colored and naturally flavored. Besides being seriously scrumptious, these whoopie pies are freezer-friendly and can keep for about six months in the freezer. Personally, I love to eat them straight out of the freezer. They taste like an ice cream sandwich! Whichever way you choose to eat them - fresh or from the freezer - you will be amazed with these yummy treats. Enter to win The Piping Gourmets Whoopie Pies from 10/27/14 to 11/09/14. Win a Bundle of Flapjacked Protein Pancake Mix! Chance to Win the Strongest Sprializer Yet! Enter to Win the Kitchen Supreme Vegetable Spiralizer! Win a Wonderfully Raw Brussel Bytes Prize Pack! Enter to Win a Prize Pack of Paleo Baking Mixes! Win a Lundberg Thin Stackers Prize Pack!